Perhaps there is truth when Benjamin Franklin said "the discovery of wine is of greater moment than the discovery of a constellation." " The universe is too full of stars, " as he added. Well, I love looking at the stars, but there are times that their glitters and sparkles are not that valuable as sipping a good wine that just makes you say, "Ahhh! Don't you just love life and this refreshing sparkling glass of sweet champagne." What if I tell you that there were 500 kinds of wines and spirits collected all-together in one setting, in one night just for everyone's pleasure, and if taken in the context of the assembly of stars, oh boy, I bet even the constellation observer would be happier to spend the night rather than gazing at his discovery. I'm blabbering about the recently concluded 16th Grand Wine Experience which I was so happy to be a part of. This event is held every year and for 16 years, the event grew bigger and more extravagant. This is the second time they have held the event at the biggest ballroom of the country, The Grand Ballroom, Marriott Manila at the Resorts World Manila. When they said "It would be beyond the usual drink-all-you-can wine dinner," it wasn't an exaggeration, for I myself was so overwhelmed to have seen so many wine brands, origins and cocktail, I never knew where to begin. But well, I'm happy to announce, that after being able to grasp the quandary of this event, which I was definitely new at, I found myself having sips after sip of Italian wines even before having my appetizer. How I wish I have the stomach to taste and drink all these Italian wines, but there were more than five countries that joined and brought their most favored wine varieties. What would go well with wine, you ask? Cheese, charcuterie, pate and olives and some crema de tartufo and preserved peperoncino. These were freely lain on one table care of the company that brought the Italian product Robo in the country. This wine fest had been successfully organized by the Philippine Wine Merchant and it wouldn't be as festive as it was without Marriott Hotel Manila's buffet spread. The night was once again hosted by the top wine connoisseur Ines Cabarrus-Habayeb. The A-List in the Marketing world. 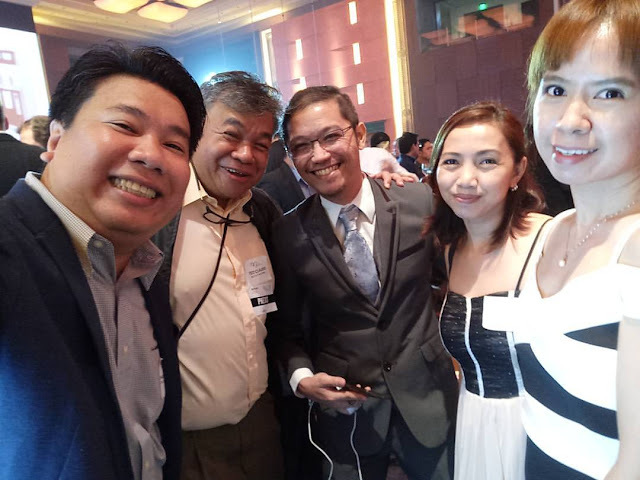 Jonel Uy from Digital Circles, Owen Camayo from ResortsWorld Manila, and Hubertus Cramer, VP F&B of Resorts World Manila. Thanks Digital Circles for this opportunity! T'was nice bumping in to these guys, I'm sure they too had quite a fun night, like I did. Across where we made "tambay" (hang-out) are these top-rank personalities in the marketing and food business - Joel Pascual of WOFEX, Lolly Tiu (owner of Jonas Pares, chain of resto), Dee Ledonio of Coltrans and Dee's Gourmet Popcorn and Ms. Frenchie, of AIMS. The event started with a bang and heart-felt welcome gesture at 6 pm, but I came at 7 pm, ended it at 10 am. However, the non-stop eating and drinking was up until about 1 am. I guess many got wasted from this. I made sure I went home still sanity and wit intact, despite the many wines ranging from 12% to 14 % of alcohol content, apparently wine drinking has to be coupled with food and making sure you get water in between wine glasses. But after 3 hours of going around and staying in our assumed couch space, which 6 of us bloggers having turns of being seated, and having heard that Trixie Reyna, whom I assumed to be more educated with the beverages and is an expert on wines and spirits, have had three glasses of gin drink, I gave in and joined the throng of gin lovers crowding our small pocket of haven and tried it. I've been to a couple of wine and dine events but this one, nothing quite like it! I wasn't able to count how many glasses of wines I was able to try that night (so many). The chairs and sofas were a few but I quite enjoyed moving about and getting bits of everything while wine-hopping from one brand to another. It was also my first time to try a gin drink, which was flavored with lime and some other fruit and mint. Do forgive me for not giving you actual names of the wines and cocktails, as I was just having fun trying one after the next, I totally forgot I was working and covering the event. I discovered that this gin drink went so perfectly well with the mini gold embossed chocolate bar which I got from the dessert swing. Yup you read it right, a gigantic chocolate bar hung from the ceiling was one of the highlight of the buffet and there were two of them one on each end of the room. The one drink many guests have been raving about and the most expensive whisky was that of Dalmore. There were also Hennesy and Remy Martin which I didn't get to try. But like many of the guests, I made sure to try Dalmore, and see and taste why is it highly-coveted and priced as such. P 2.5M. Of course, no sampling was allowed however, I did try the 15 year old Dalmore. I almost could not take a sip, (not a fan of whisky or vodka or any hard alcoholic drinks) as the woodsy aroma is so striking it hit my olfactory bulb with a pack. I did take the courage to have a sip and it really took a toll on my esophagus. (As in "pang-sunog-baga," excuse my being such a novice on this manner). Tried having it with some macarons, it didn't dampen the strong bitter dark plum and marzipan flavors. And knowing how expensive it was, I told myself I have to finish my glass. With this I told myself " Sorry, but this night has to end until it lasts." Damn apologetic of myself, and no I didn't get drank, I had to end the good night with Dalmore's 15 year old whisky. So, I went home with a husky voice, a taste of what seemed like an old Christmas Fruit cake on my mouth and rosy cheeks and this experience which I'll be keeping in my precious memory bank. Oh, yes, now I'm saving up for the next Grand Wine Experience next year. Congratulations to PWM and the partner brands who had their hands full from this event. Do check out their website grandwineexperience.com/ for more upcoming events. You look gorgeous Joy! I love your outfit. Hay, I missed the Grand Wine Experience. This place is absolutely gorgeous, beautiful and stunning. Even though a few halls are equally appealing and fascinating in their decor, food and aesthetics, I'm tempted to still give these San Francisco venues slight edge. The essence of this fruit is very overpowering. Along these lines, don't stress. Eat to your heart's substance. Your heart will be solid and you will get more fit too.